She's had her hands full promoting her latest album and releasing a bestselling memoir. 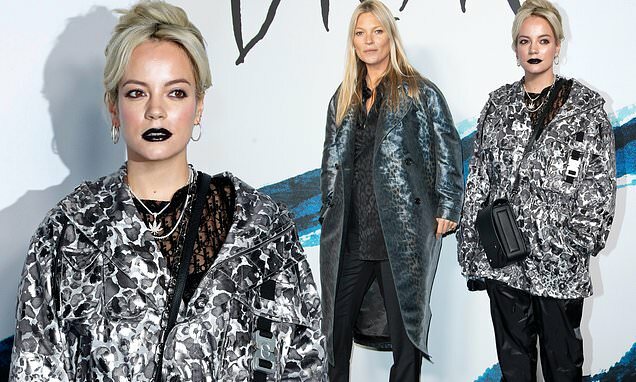 And Lily Allen, 33, turned out in style as she led the celebrity glamour alongside Kate Moss, 45, for the Dior Homme show in Paris for Men's Fashion Week on Friday. The singing sensation looked incredible as she showed off her quirky sense of style in a light blue baggy coat with a navy and white floral pattern. Proving her fashionista credentials, the Smile hitmaker paired her daring ensemble with a black mesh top and some statement navy baggy trousers. Boosting her diminutive height, Lily completed her bold outfit with a pair of glittering heels, while styling her platinum blonde locks in a glamorous up-do. Accessorising with a black shoulder bag and plenty of silver necklaces, Lily donned fluorescent-painted nails and a pair of shades to match her dramatic black lipstick choice. The songstress was clearly in demand at the star-studded event as she posed for the cameras when stepping out of her car and being brought through the crowd with the aid of security guards. Meanwhile, Lily recently revealed in her new book that she signed a record deal for an extremely humble £25,000 for a whopping five albums 14 years ago - and is still locked in the contract.